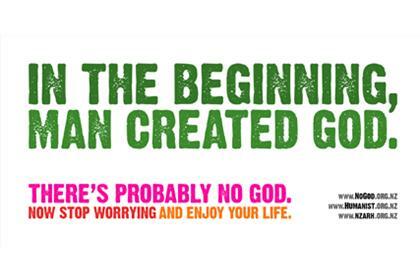 Continuing today’s antipodean theme… above is an advert by The Humanist Society of New Zealand. The advert recieved just a single complaint from the laid back Kiwi public, in stark contrast to the 392 complaints that the British Advertising Standards Authority recieved when the British Humanist Association’s ran an advert stating “there’s probably no God” (in riposte to a bus-side ad by The Christian Party which told consumers that “There Definitely is a God”). what a load of compleate crass there MUST be a God, just because u cannot see him doesn’t mean he isn’t there!!! U cannot see the wind but u still believe it’s there u see its effects!!!!! U have NO evidence 4 ur accusation! We have the BIBLE! The bible was written by man not god. I can see the wind and I also choose to live out side the box. I m sure god does not exist and have no issues with saying that. Be brave and think for your self.